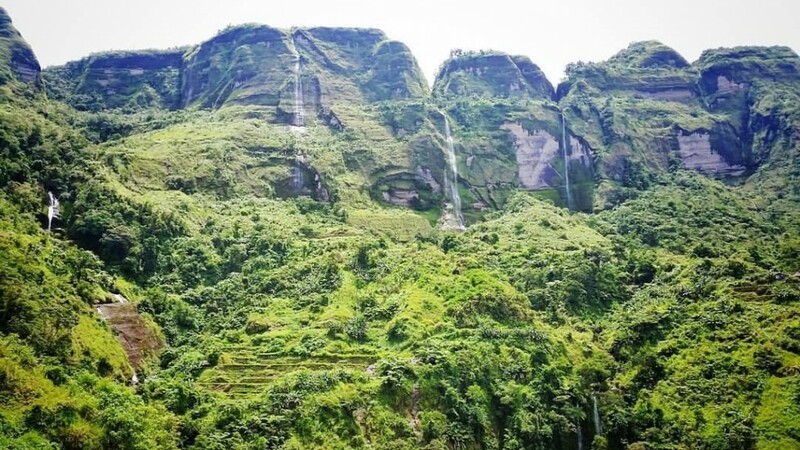 MANILA – In light of the devastating effect of Typhoon Lawin in the infrastructure of Northern Luzon, Pinoy Mountaineer would like to warn hikers of possible road and mountain closures. We are also asking for updates from the various mountains so we can post them here. 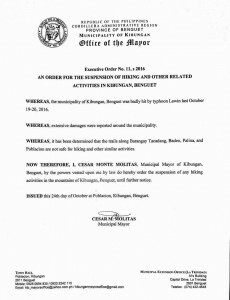 In Kibungan, the mayor has issu ed an order temporarily suspending hiking activities, given the damage to the roads and trails (see full details in image; thank you Kyler Catalino for sending this). The road to Bakun may also be closed at the moment and can compromise the plans of people planning a Bakun Trio hike. Mt. Pulag and Mt. Ugo are accessible. We are trying to verifying the status of the other mountains. We expect, however, that the closures are temporary. Importantly, do not just rely on this information: those who have scheduled hikes are advised to contact local authorities or guides directly to have the most accurate information. Also, check the road closures as reported in the DPWH and other websites.